A great high speed, high drama thriller which I sped through in two sittings, Pariah has been out for a few months now, but managed to somehow slip me by. Rave reviews made me sit up and listen, and the good news is that there’s more to come from debut crime author David Jackson. The result of a high commendation from the Debut Dagger awards by the Crime Writers Association led to Pariah being picked up and published by Pan Macmillan and a sequel is on its way. I’ve been a sucker for most things set in New York, and this tale of an NYPD Detective, Callum Doyle, was no exception – but not purely for its setting there. The whole concept that to damage Doyle in the worst possible way a killer seems to be on a mission to target those around him, starting with his cop partners and then setting sights on his family makes for a very disturbing premise. Doyle is forced off the case of seeking his partner’s killer and then runs from his wife and daughter and tries to stay away from everyone he cares for so as not to place them in the line of fire. Once he’s clear of the Police Department, they seem glad to have him away as it seems to take the risk away from them and so investigation into his case slacks off, leaving Doyle isolated and alone in the world. He’s being pursued by Internal Affairs and by members of the criminal fraternity and he has no way of knowing just who he can trust. Hands seem to be offered at every turn to help him, but Doyle runs the risk of placing others between him and the killer or implicating himself in the deaths of his partners. I hesitate to use the words ‘page-turner’, but lost track of the times when I promised myself I’d just read one more chapter and then take a break, only to find a shattering twist or development meant there was no way I couldn’t read on – so a ‘page-turner’ it most certainly is. With Callum Doyle isolated from his family, I couldn’t fail to see the irony that, this evening, I chose to stay home and finish the book whilst the rest of my own family went to a party – it really had me that gripped. Pariah has a great quality and voice and, set in present tense, an immediacy to it that I think would translate extremely well to film too. But, until that happens, I’m very happy to read more of Detective Callum Doyle in future novels. Grab some Guinness, or coffee and donuts, a copy of Pariah – and you’re in for a damn good time. 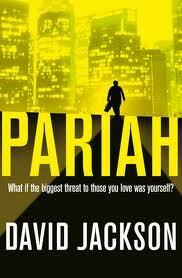 Excellent story on Pariah by David Jackson | Books and Writers.